How documenting our process has become a core part of how we design at Deliveroo. Way back when I was in the midst of my graphic design degree, touching on everything from branding to “book-making” (that one was painful), there was always one thing expected from every student when they handed in their project — the process book. 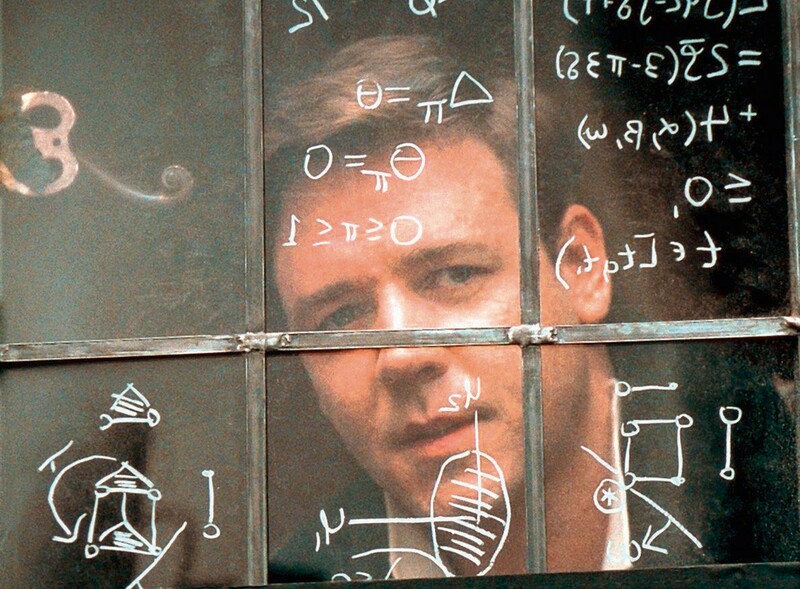 Our professors knew when it was a farce, hastily put together right before a deadline. Not only because it read like a farce, but because it showed in the work itself. Taking the time to tailor one’s process helped us think broadly and not dive too fast into the details, to identify patterns and relationships in what were conceptual and visual systems. It helped us to identify core problems before diving into solutions, no matter the deliverable. Sound familiar? As a product designer these days, it’s safe to say you’re often dealing with complex problems that stem from a variety of sources. Different products face different problems, some face deprecated codebases or slow APIs, others an ill-equipped CS team. Perhaps marketing is disconnected from product and your CRM is suffering. Conversion is suffering and users are complaining about a recent change. These are all things which can contribute (often together) to form a thorny problem that needs to be broken down and thoroughly understood before you can even approach finding a solution. When you are ready to move onto solving that problem, how do you keep track of the multiple directions you’ll explore? Why one worked over the rest? Do you have the links to those research findings you keep referencing? What exactly do you mean by the system? What about that meeting where you received feedback that might completely change your favoured direction? Did you make sure to take notes? Where can your engineers find that ruleset diagram? What about the final mocks and those prototypes? Writing can be incredibly useful for every step in a designer’s process and its benefits to cognitive comprehension are well known. This is especially important towards the beginning of the design process. Meticulously laying out what the problem is and why it exists, corresponding research or analytics findings, jobs to be done, and design goals helps you wrap your head around the complexity and lays out a foundation from which to progress from. Not only this, but if you’re sharing your doc in crits or with your team you’ll be consciously self-editing to make things as concise and presentable as possible, getting rid of useless verbatim and further providing clarity to yourself. We all know how tangential solutions can be, and a variety of mediums are used by today’s product designers in order to convey them. Words, wireframes, diagrams, low fidelity and high fidelity prototypes, simple static images or videos detailing complex interactions, even code. Although designers work in a variety of tools to create all these elements, it’s key to gather them in a central location to be viewed holistically. Even if process is the act of re-applying specific strategies to different problems, things never go according to plan. Crits or discussions with engineering may impact your initial direction. The doc allows you to keep track of all these meetings and subsequent changes. A clear source of truth that you can always point to. This becomes incredibly important for larger projects, where it’s often hard for yourself and others to remember specific decisions made weeks ago that are responsible for the solution they are seeing today. Just be glad you don’t have to document on Windows. A well structured and concise design doc doesn’t help you just put together your own work. A team that makes docs a core part of their process makes the lives of their fellow designers much easier when it comes to overall visibility. It can be painful to try and get context on what other’s are working on, especially when their decisions might have impact on your own work. Perusing through Slack or going through Sketch files isn’t great for catching detailed decisions. Face to face meetings always help, but a meeting is time consuming and getting in the habit of too many meetings can result in very bad things happening. The doc provides the best hands-off way for catching up on all the context needed to gain an understanding of your fellow designers’ work. The thing is, we’re all picky about our tools — especially designers. Sketch dominates primarily because it got rid of the bloat of its competitors and strove for speed and simplicity. Many think of documentation and envision a clunky Google Doc that sits awkwardly around print layout, one that struggles to handle simple images and relies on Google’s drive eco-system for collaboration. Here at Deliveroo, we’ve fully embraced Notion as our go-to design doc tool. Firstly, as an individual designer it’s a joy to use. It caters perfectly for detailed write-ups that require all the the multiple forms of media I mentioned earlier, while being fast and beautiful. Notion also allows teams to work in the same area, perfect for overall visibility. Before joining Deliveroo, I spent a few years at Intercom as a product designer in Dublin. During my time there, we honed down on a specific structure to our process when tackling complex problems. 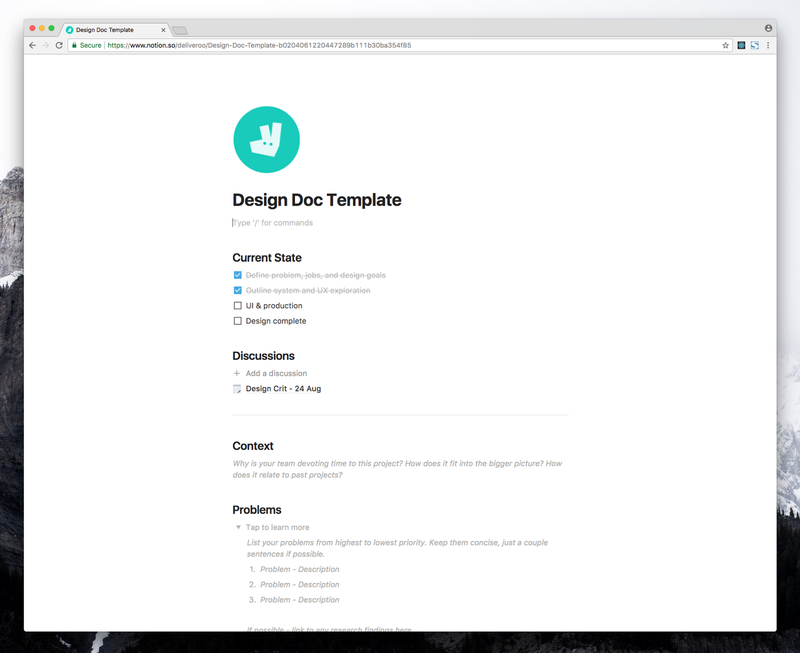 With some slight modifications, I created a template in Notion and started using the doc heavily for my initial projects at Deliveroo. Soon enough, designers, content strategists, even engineers were asking about what tool I was using. Within a few weeks, Notion and the design doc template had taken root across the product org from the ground up, and with genuine excitement. Awesome. The process itself is broken into three sequential parts. The first being to provide context, state problems and jobs, as well as linking to any supporting research or analytics. The second is a concept or system design with high level solutions. The third and final part is for high fidelity mock ups and prototypes. There’s also a summary section at the top, so anyone viewing the doc can see the current state of the design phase. Within the summary we also deep link to sub pages for discussions/crits/meetings which might influence the designer’s decisions. Notion’s deep-linking hierarchy makes this all incredibly simple to setup. You can check out our template here. Now that Notion is ingrained within the product org, each of our product teams has their own area which includes a template button. One click and you’ve created a new design doc using the template described above. Simple, fast, easy to change. Now I’m sure many of you are saying this is all well and good, but this seems like a lot of work when I or my company moves fast. As mentioned before, the design doc is a great tool to tackle large complex problems. At Intercom, we had a general rule of thumb that applied to our write ups. If a project is going to take less than a week to design and build, it’s usually not worth diving deep into the weeds at the cost of speed. For the larger problems for which you and your team have properly devoted time and resources to solving, following a clear process through the design doc can be a game changer. To this point, one of the most important things you can do as a designer to help your PM and engineers understand the importance of your process and respect the need to deep dive when it’s suited for the project. Regularly share the progress of your work through the doc, use it to present at team meetings, get people discussing it and using as a point of reference. Everyone appreciates a central source of truth to refer to. Just make sure to adhere to a structure that works, be concise and write your doc knowing that it’ll be viewed by others. One of the most important things you can do as a designer to help your PM and engineers understand the importance of your process and respect the need to deep dive when it’s suited for the project. Product problems are multi-faceted and incredibly complex, often messy given the relative youth of our profession and industry. As a designer, documenting your process is not only a great way to help break down these problems and stay organised, but allows for your fellow teammates to stay up to date with your work and better understand your process. Tools like Notion actually make documentation delightful and cater to all the deliverables needed to form viable, holistic solutions. 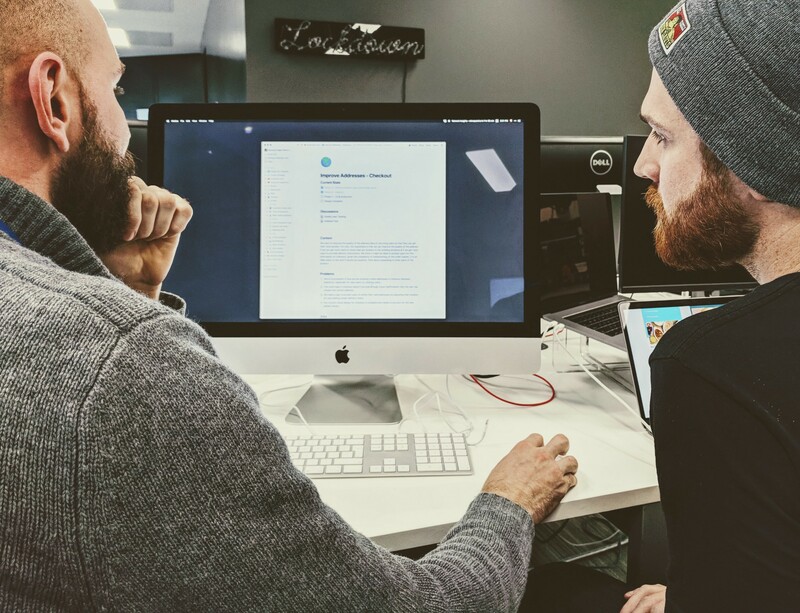 We’ve fully embraced design docs from the bottom up here at Deliveroo, as we did at Intercom, because we’ve seen the impact they can have on shipping high quality, well thought-out work, as well as helping everyone across the company understand our process. We’d love to hear how you all document your process and what works for your team. Feel free to give us a shout at Deliveroo Design Team. If you like what you’re reading, we’re hiring product designers, content strategists, and researchers! Thanks to Jonny Burch, Aimee Quantrill, and sana rao.